In these situations, a regular ComboBox just won’t cut the mustard; it doesn’t show the structure of your data and its drop-down shows every item, whether you like it or not. I have explored the challenges associated with writing a control like this in Windows Forms at great length, and i’d like to share the common pitfalls as well as the ultimate solution, which revolves around the ToolStripDropDown control. What is a drop-down, really? So, how does one achieve this behaviour? Those last few points seem to represent a drastic departure from the way forms and controls work! So, you decide to implement your drop-down as a Form. You make it borderless, suppress it from the taskbar, perhaps make it TopMost as well. You might even make it an owned form. Whatever the particulars, your users click the drop-down button and the form is shown. There’s a slight flicker/flash as focus switches to the drop-down’s form. The parent form’s title bar changes colour and its drop-shadow (under Aero) narrows. The user makes their selection via the controls on the drop-down form and it closes. Focus isn’t restored to the parent form. Keyboard input ceases to have any effect, so the user can’t tab to the next control. As soon as they click on the parent form again, focus changes, the title bar changes colour and the drop shadow expands. There might be an unsightly flicker too. And if you think it looks passable, try opening and closing the drop-down several times in quick succession. Overall result? Loads of superfluous clicks and a very poor user experience. This actually works; clicking the drop-down’s form will not cause focus to change. The problem is, your drop-down isn’t just going to consist of the form itself. Clicking any control on the form will give focus to the drop-down’s form, undoing all your good work. You can replicate the message interception technique for every control on your form, but some controls (e.g. the TreeView) won’t play ball. Selecting a TreeNode, for example, will always set focus. So, at the end of all this fuss, you’re left with a series of subclassed controls and low-level code. And what does it get you? A drop-down that will give you a nice user experience… as long as you don’t actually click on it. Ultimately useless. Finally, you might think that using a Control and adding it to the parent form might be a clever way of avoiding issues with focus… and yes, it does completely mitigate that problem. Unfortunately, you’re now left with a drop-down that can’t extend beyond the parent form’s client area. You might think this is fine, so long as your drop-down control has plenty of space below it on the form… but doesn’t that completely defeat the purpose of having a drop-down in the first place? This ‘solution’ is also a dud. Forms take focus from their parent, but also have a separate notion of focus for their controls. Controls take focus from their parent, but surrender it to their children. Menus share focus with their parent and children. This behaviour represents exactly what we want out of a drop-down, however the ContextMenuStrip has a very specific purpose. Looking into its inheritance chain, we can find ToolStrip, ToolStripDropDown and ToolStripDropDownMenu. The first doesn’t represent a menu, so that’s no use to us. The second is the base class for a drop-down, which makes a good start. It’s worthwhile to note that ToolStripDropDown doesn’t support scrolling (whereas its next descendant does), however with the method i’m going to use to implement my drop-down, automatic scrolling support won’t be necessary. Any derivative of ToolStripItem (labels, buttons, etc) can be added to a drop-down, including ToolStripControlHost (although i’ve elected not to simply host a TreeView control inside the drop-down – there are still some quirky focus issues in doing this, not to mention the overheads involved). The drop-down itself must contain at least one item, even if it takes up no space. Being a descendant of Control, it can be painted by overriding the OnPaint method and can respond to mouse and keyboard events as well. Combined with the non-focusing behaviour, this gives us all the tools necessary to create a drop-down that behaves as expected. The full functionality of the TreeView is not required for this drop-down control, so a similar (but simplified) data model will form the basis of the implementation. DropDownBase contains the basic functionality for the editable portion of the control; painting, event handling and design-time support, as well as management of the DroppedDown state. The data model centers around ComboTreeNode, which is akin to TreeNode. The circular relationship between it and its collection type, ComboTreeNodeCollection, creates the tree structure. ComboTreeBox is the primary implementation of DropDownBase. It holds and controls the data model, and visualises the selected node. It also holds ComboTreeDropDown, the actual drop-down (descended from ToolStripDropDown). In this implementation, the data model is completely separated from the view; nodes can be defined and manipulated independently of the control/drop-down. ComboTreeNode is a simple, atomic class used to hold the node’s name, text, state and model its relationship to the other nodes in the tree. ComboTreeNodeCollection represents a sub-tree, and is therefore associated with an owning node. The only exception to this rule is for sub-trees which have not yet been added to the control, and the root collection which belongs to the control. 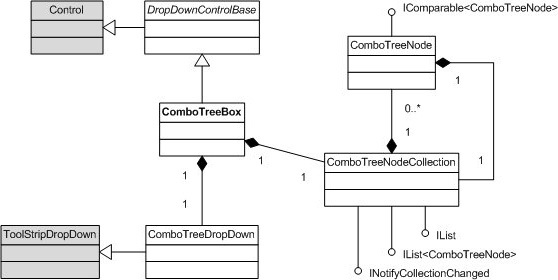 Neither class depends upon ComboTreeBox, however both take on additional properties and behaviours once added to the control. It also implements the non-generic IList to provide compatibility with CollectionEditor, used by the Windows Forms Designer. A reasonably simple set of rules govern how the connectors between nodes in the tree are drawn – in fact, it’s possible to isolate the different permutations and cache the resulting bitmaps in order to save on processing and memory (these permutations are represented using the BitmapInfo structure). The superset of visible nodes changes whenever a node is expanded or collapsed, or if nodes are added/removed from the tree. Changes to the size and font of the owning control will also cause the set to be re-evaluated. Scrolling is implemented manually, on a very simple principle: A contiguous subset of the visible nodes, the size of which is determined by the maximum height of the drop-down, is selected using an offset. The range of the scroll bar is equal to the total number of visible items, minus the size of the largest subset that can be displayed in the drop-down. The position of the scroll bar can be expressed as a percentage of the offset, relative to the range. The size of the ‘thumb’ on the scroll bar is equal to the size of the scroll range as a proportion of the total number of visible items. To actually render the drop-down, then, the visible nodes within the scroll range are positioned, relative to the top. The visual properties of each node are represented using NodeInfo. There are two painting operations per node; the (cached) bitmap which represents the indentation, node image, glyphs & connectors, and the text on the node. If the number of nodes in the scroll range is less than the total number of visible nodes, the scrollbar is painted too. Moving the mouse over an item causes it to become highlighted, however the selected node does not change unless the item is clicked. Navigating with the keyboard (up/down) changes both the highlighted item and the selected node. Scrolling (with either the mouse wheel, keyboard (page up/page down) or using the scroll bar) changes neither the highlighted or selected items. The ability to assign a Name to each node, which can be used to access the node in its collection. Use of ImageIndex/ImageKey to specify an image for each node. Persistence of the Expanded state for each node. SelectedNode property to get/set the user’s selection in the tree. PathSeparator and Path properties to express the selected node as a path string. BeginUpdate()/EndUpdate() methods for bulk adding. ExpandAll()/CollapseAll() methods to manage the tree. Ability to sort the tree (performs a recursive sort, using either a default or custom comparer). Recursive enumerator (AllNodes) to iterate over the entire tree. Ability to choose whether paths are constructed from node names or text. Ability to set the selected node using the Path property. ExpandedImageIndex/ExpandedImageKey to allow a different image to be displayed for expanded nodes. Horizontal scrolling (visually unappealing on a drop-down). Checkboxes beside nodes (this would imply multiple selected values). The ability to customise the visual elements or owner-draw the control using events. SelectedImageIndex/SelectedImageKey properties (which, personally, I find useless). Tooltips on nodes, drag-and-drop and other functionality outside the scope of a drop-down. A Sorted property to create an automatically-sorted tree; instead, they can be sorted on-demand. The ComboTreeBox is an example of both the need for custom drop-downs, as well as the solution to the problem of creating one in Windows Forms. The ToolStripDropDown component makes it all possible, even though (in this case) it places the burden of implementing the content of the drop-down manually. This was also a very useful learning exercise in writing a custom control which adhered to established conventions for appearance, behaviour and the handling of input. I am particularly pleased with the elegance of the scrolling mechanism and the use of bitmap caching; with these, I was successfully able to populate a drop-down with several hundred thousand nodes without suffering a significant performance hit (even though such volume would be thoroughly unsuitable for a drop-down!). I hope it proves useful in its own right, as well as in its capacity for demonstrating how to implement a custom drop-down. Posted in GUI components.Tagged abstract classes, C#, collections, custom controls, enumerators, graphics, GUI design, Windows Forms. The .NET Framework 4.0 Client Profile does not include the System.Design assembly, which is used to provide design-time support for the control. It is theoretically possible to remove the run-time dependency on this assembly by moving design-time classes such as DropDownControlDesigner into a separate assembly. The “design-time assembly” targets the full framework, whereas the “run-time assembly” only targets the client profile. You then have to change any instances of the [Designer] attribute so that they specify a string name instead of a Type. Bear in mind, however, that I have never tried this before. I am still using Framework 3.5 for most of my projects. You might want to read up on techniques for separating design-time code from run-time code. I follow your instruction and i used the ComboTreeBox on .net framework 4.0. Thank you very much, this solved my problem. Would you be able to post your updated files for the 4.0. framework…? Thanks Brad for a wonderful and useful tutorial. Hi Brad, thanks a lot for the instruction. I commented out those “designer…” code and now it works on .net framework 4.0 client profile. Not an ideal solution but helps get my job done. I’ll revisit the code and make it fully .net framework 4.0 client profile compatiable when having time. BTW, what should I do if I want the control to support DataBinding? Data binding is more complicated when you are dealing with a hierarchical data source; conventional data binding only works with flat lists. You would have to determine what form your data would take (tree data structure, DataView with a self-referencing foreign key, nested objects, etc) and then write appropriate routines to support them. I did not provide data binding support in my implementation for the simple reason that there is no standard representation for this kind of data in the .NET Framework. The only problem with this solution is that the combo box renders as a toolstrip combo box and will appear much different than ‘normal’ combo boxes used elsewhere on your form. Take a look at Windows 7 and you’ll see what I mean. Yes, unfortunately there is no easy way to render a Vista/Win7-style combo box in the “button” style used in DropDownList mode. This is also true of any ComboBox control with the OwnerDrawFixed/OwnerDrawVariable option set, so I do not think that it deviates too much from the OS style. That said, I have since discovered a much better way to simulate that appearance; the downside, though, is that it will look the same even in future versions of Windows (which may not render in that style). I also learnt how to use buffered painting to recreate the fade-in/fade-out animations used by native controls. I may post a separate article detailing how to use these. I like the control. Would prefer to see a standard combo drop list rendering but I can live with that. I remove support for INotifyCollectionChanged because the inclusion of WindowsBase.dll in all my future project is a too much heavy price to pay and it seems to work well anyway. Developer Note: If you have a Get/Set property markes as Browsable( false ), please also include the very useful bool ShouldSerializeXxxx() (where Xxxx is the property name). By having that method returning false, it tells the designer not to add initialization code. This prevent the form designer to add a myControl.MySpecialField = (MySpecialType) new MySpecialType(); in all the non browsable properties. Most of the time it cause problem whem the type is not a System type. /// Gets or sets the first visible ComboTreeNode in the drop-down portion of the control. Thanks for your comments, HEMEL. Since .NET Framework 4, INotifyCollectionChanged has been moved from WindowsBase into System, so it no longer incurs any overheads to use. Please have a look at a revisited version of the control here: . I prefer to use the [DesignerSerializationVisibility] attribute to control serialisation instead of adding lots of additional methods to my classes. Sorry to ask such an elementary question but now that I have the source code, what do I do with it to use it in a project? I do quite a bit of C# development but this in not the normal thing I do. Maybe an sample project that uses the code would be helpful. Jim: It’s as simple as dropping the source files into a project of your own. After the first successful compile, the ComboTreeBox control will automatically appear in the toolbox in Visual Studio. thanks a lot of your beautiful component. I’ve a problem with RightToLeft property of control, that is doesn’t work properly, the drop down list doesn’t move to right side. Mohammad: I did not factor RTL support into the design of the control, as I am not familiar with the rules associated with it. You would have to add a condition in the OnPaint() method of the ComboTreeDropDown class to use a different combination of TextFormatFlags if the RightToLeft property was set to true. That will reverse the text, but the scroll bar, expand/collapse glyphs and dotted lines would be unchanged; further changes to the painting method would be required to completely reverse the layout. thanks a lot of your guidance. I have been able to load your control with data but when I click it during run time it doesn’t make a selection. It highlights the desired option but doesn’t collapse the dropdown nor fill the combobox text property with the user’s selection. Your thoughts?? I can’t reproduce your problem, Maverick. Bear in mind, however, that the dropdown will only collapse if you click on the text associated with the each item; clicking the plus/minus glyph or the image will simply collapse/expand the node. Can you send me an example how to add items to this combo? I hope that example helps! Thanks for this control. It almost does what I need but need a little more functionality. One is the ability to Display a Simple DropDownStyle combo box meaning ability to type a value in the drop down text area. The second is to add the autocomplete feature to search through the node collection when the user starts typing to find the matching node. If you can give some pointers on how to add this functionality I would really appreciate it. This would actually be quite complicated to implement. By adding the ability to enter text, you would need to change the mouse cursor (depending on the position), render a caret, handle keyboard shortcuts (arrow keys, copy, paste, etc) and more. You also have to resolve the problem of where to create a node if the user enters a custom value; does it automatically become a top-level node, or must the control attempt to interpret a path from the text entered into it? Autocomplete would not be that difficult by comparison; it could be implemented using another ToolStripDropDown which is displayed when the user begins to enter text. All that would be needed to find matches in the list of nodes would be some simple string manipulation (and, optionally, LINQ). However, because the control does not easily lend itself to supporting text entry, this may not be worth pursuing. Thanks for a great control! I’ve added a simple ‘auto complete’ that replicates the SuggestAppend behaviour of a standard ComboBox running in DropDownList mode. There is no text entry control, but pressing one or more keys selects and displays the appropriate node from the dropdown tree. It seems to do what I require, but if you (or anyone else) has any comments or further improvement I’d be interested. Hi Brad, first I would like to compliment you on your tool that you have made. I am using it in a project and am very pleased as I have been looking for this functionality and hadn’t found it until this. One thing I was hoping to find out is that if I want certain nodes to not be selectable (they are the group name and only the nodes below it in the hierarchy do I want to be able to select). If you have time I was wondering if you had any recommendations for me on implementing this. I can provide more details if needed, thanks in advance! Thanks for the kind words, Joel! What you’re asking would be relatively simple to implement. Each node would require an additional property (‘Selectable’ or ‘Enabled’ or whatever) and this property would have to be inspected in the OnMouseClick() handler for ComboTreeDropDown to determine whether to update the selected node or do nothing. Code would also have to be added to SetSelectedNode() in ComboTreeBox to throw an exception when an unselectable node was passed to the method. You could also enhance the control graphically to avoid highlighting nodes which cannot be selected, but that’s just a visual detail. I was able to make the changes to make certain nodes not select-able as well as not highlight-able. Thank you for your tips as they helped me navigate to the correct areas to make the proper changes! I can email it to you if you would like. My code is in C# only. However, if you compile it into an class library, you can reference that assembly in any VB.NET project. If you begin with an empty Visual Studio project, the easiest way to add the references is to right-click the ‘References’ folder in the Solution Explorer, choose ‘Add Reference…’ and tick the boxes beside the two assemblies mentioned above. They are both part of the .NET Framework 3.5 and above. I successfuuly build and populated with the code u above n its working fine !!! and thank u so much for your reply!!! If you right-click on the C# project and choose Properties, then click on Application, you’ll see an option called ‘Output type’ – you can change this from ‘Windows Application’ to ‘Class Library’. When you compile the project, it will create a .DLL instead of a .EXE. You can then take this file, place it in the same folder as your VB.NET project and then add it as a reference (as in my previous comment, but this time clicking ‘Browse’ instead of ‘.NET’). Once you’ve done this, the control should be available in the toolbox (although you might have to build your VB.NET project first). As long as you keep the DLL file in the same folder as the project, it should work fine on any computer. When you compile the project, it should automatically place a copy of the DLL in the output folder – and it will also get picked up automatically if you are building a setup project or deploying via ClickOnce. As far as portability goes, Visual Studio projects compile to ‘Any CPU’ by default, so it will not matter whether the other computer is 32-bit or 64-bit. In general, VS makes it easy for you to reference other code in your own projects. You may have to right-click the toolbox area, select the ‘Choose Items…’ option and manually browse to the DLL. Visual Studio does not always do this automatically. Im populating data from database to combotreebox. How to get the selected node’s txt and key? ok thanks can i have this control inside datagridviewcolumn? This is not currently supported, but i’d be happy to develop a DataGridView column type to accompany the control at some point in the future, if there was demand for it. If you have any further questions, you will have to research the answers on your own. I have another question you might be able to answer: where do I control how a selected node appears? 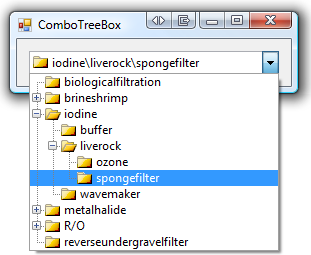 In the image at the top of the screen has the select node text of “iodine\liverock\spongefilter” and it is not bolded. For some reason, whatever node I have selected and the text appears at the top is bold. Also, how is the path (node selected is just spongefilter) appearing at the top for the selected node and can the names be separated by a space instead (e.g. “iodine liverock spongefilter”)? The selected node is displayed using the control’s Font property. If you didn’t explicitly set this to a bold font, remember that the designer applies the parent control’s font by default. Whether the path is shown or not is controlled by the ShowPath property. You can control the separator between nodes in the path using the PathSeparator property; the same convention that the ordinary Windows Forms TreeView uses. 1) BB1 Selected, drop-down is Open, then Closed. Please post your full code and I will see if I can reproduce the problem. I too having this error….Can you tell how u solved this problem? Please Email to me,I Send source code to your mail. When I open the form after the tree node is selected, and then close the form. And then reopen the form, and then select the tree node error. When the the second ComboTreeBox expand after loading data, scrollOffset the value is not zero??? The code should be mostly compatible with .NET 3.5 – the main difference is that I reference ObservableCollection from System.dll (under .NET 4.0) which used to be in WindowsBase.dll (under .NET 3.5). If you add a reference to WindowsBase in your project, it should compile under .NET 3.5. You’ll have to compile it with version 4 of the C# compiler (the one that comes with VS 2010). You can still target the 3.5 framework. Brad, your control is like a master’s class in how to write a beautiful control! I finally had to remove the time check, increase the timer interval to 1000ms and simply decide whether to append or replace the search text based on whether the timer was enabled or not. Despite this, it works great but my problem is that once the drop down list is displayed, the seach no longer works. Can you suggest how this could be added to the drop down as well? (this requires _lastSearch to be declared as a DateTime instead) His code still seems syntactically correct, so i’m not sure why it doesn’t compile. As for the focus rectangle – there appears to be some inconsistent behaviour in Windows Forms itself here; by setting breakpoints in the PaintContent method, I was able to observe that, when the control is initially painted, the ShowFocusCues property is set to false (hence no focus rectangle is drawn). When the control receives focus by pressing the tab key, the property changes back to true and the rectangle is drawn. According to best practices, no focus rectangle should be drawn on the control unless that property is set to true. I know that the built-in ComboBox control behaves differently, but I cannot explain why. I would not want to write a hacky solution to this problem. Before I realized it was due to WordPress turning the minus sign into an n-dash. If anyone else is having that issue, try that first. I’m also working on some minor changes which include the dropped-down box accepting the keyboard-bases searching as well as improved navigation with arrows (the best way to describe it is I’m making it mimic the native keyboard-input behavior of a TreeView as much as possible). When I’m done, would it be possible for me to send this along or otherwise share it somehow? It’s all explained on the page, but the short version is: both the combo box and the dropdown treeview process keyboard input the way normal .NET combobox and treeview controls would. Sorry, forgot to say that having a little issue with the focus rectangle. When the form containing the control is first loaded and your control is the first in the tab order, no focus rectangle is displayed even though the control has the focus. It is necessary to go to another control and TAB to brinf the focus back to your control to see a focus rectangle. I have tried to get to the bottom of this but failed. Any ideas? Hi Bradley, you may remember that I was trying to add a search facility whilst the drop down tree was visible (Gavin’s code for a search before drop down works well). Being a VB programmer, it is proving too tough for me (and converting to VB didn’t work). I am an independent developer with limited resources, but if you could add search to your core code then I would be happy to send some money your way. I very much hope that you can find the time. I was searching a control like that. Many many thanks. I have downloaded your code. But I need some modifications. Can you tell me how will I do that. First of all, my tree data are 4 level nested. Secondly those data will come from database. The table will follow id, parent id relationship. I have done populating tree from database using treeview control. But I do not know how I will use that code in your control. You will be able to populate the control without the need for any modifications. 1. Sort the records by their depth (top-level nodes first, leaf nodes last). 2.1. Create a tree node. 2.2. Add to the dictionary. 2.3. If the parent is empty, add the node to the control. 2.4. Otherwise, add the node to the parent node (by looking it up in the dictionary). The above strategy will work for a tree of any depth. Thanks for your reply. I told you that I generated the tree from the database for treeview control. I used the same technique here in your combotreebox control also. And it works. I have one problem, in the original treeview control I have been able to change the node color for the node level. In your control I can find the level using the property Depth. But how will I change the color? I have seen for the ComboTreeNode there is a property FontStyle. I tried to add Color property, but it is not working. Another problem, if I want to expand the tree upto first level during initialization, what I have to do. It has the property ExpandAll. Finally, once again thanks for your brilliant control. But it is not clearing the control. Here also combotreebox is not assigned new value. How will I solve above two problem? I have a tree up to 4 level. I want to find all child nodes for a selected node. How will I do that ? Keyboard functionality, using F4, Escape, Enter, etc. keys, do not work. 1) F4 key cannot be used to toggle display dropdown, i.e. TreeView. 3) When TreeView is in dropped-down state and an item is selected, pressing Enter key won’t hide the drop-down portion. 4) Up/down arrow keys cannot be used to display drop-down and move selection. Thanks for letting me know, i’ve released an updated version of the drop-down controls here. However, both (3) and (4) in your list of issues had already been implemented. Perhaps you weren’t using the latest version at the time. There is no option to include “Select ALL” in the parent node. Is that possible to do in this control ? Do you mean ‘check all’, as in when ShowCheckBoxes is set to true? If so, you can use the CascadeCheckState property to check all child nodes when the parent node is checked. Otherwise, are you talking about multiple selection within the control? If so, the ComboTreeBox does not support multiple selected nodes. I mean if we can put a “Select all ” like in MS excel filter , above all parent nodes and if we click on that checkbox, every options that is in the treeview should be selected. Bradley Hello, I am Brazilian, congratulations on your art, I am implementing in my project, it is getting great. I am working on the screen usability and am having trouble updating the property ‘Text’ or ‘Node selected’, I would leave empty the component on the screen for the User having to reselect a node, but it does not obey! /// Moves the scrollbar in response to the mouse wheel moving . Thanks for the additional event handler code, I can see this being very useful. Out of curiosity; all the mousewheel event handler code I could find was for the ComboTreeBox. What was the usefulness of this? As far as I could tell, one could only scroll with a mousewheel with the ComboTreeDropDown open, by placing the mouse pointer over the ComboTreeBox. It works great for me, but I would like to implement ToolTip. do you successfully implement tooltip on nodes now ? I have just released an updated version which adds a ToolTip property to the ComboTreeNode class. Please try it out and let me know if the functionality meets your requirements. Great controls! I was trying to set the back color for the combo tree box with Visual Style enabled but wasn’t able to. Is this possible? I don’t offer this functionality with the control because the operating system can only render it using the system colors. As visual styles are intended to create a consistent look-and-feel across all applications, changing the background color would go against this principle. Great work! Thank you for this! Do you happen to know if I can add a FlatStyle property for the ComboTreeBox Normal? This functionality would have to be implemented manually, by adding a FlatStyle property to DropDownControlBase and implementing the rendering logic for the other styles in the bufferedPainter_PaintVisualState event handler. This would not be too difficult, but I cannot offer any guidance as to how the Flat or Popup styles would be implemented. Is it possible to expand tree clicking on Node instead PLUS if Node is not a leaf? if i click on A and not his plus is it possible to expand the tree? Where can I get the source code for this.? It’s available on the Drop-Down Controls project page.